Banded scored slipware, pink exterior and green interior. Solid stem handle with pinched end. Green colour to pinched end. Good condition with slight overcooking to interior glaze. There is slight exterior crazing consistent with age. There is so much information available today about the Boyd family and their artistic legacy that I won't repeat too much here. These three AMB (Arthur Merric Boyd) ramekins are crudely glazed and made like much of their output. Their apperance shows them to most likely be very early examples of the work of Arthur Boyd and John Perceval. They are glazed in classic John Perceval colours of green and pink. The hand made stem handles with pinched ends are, as usual roughly made. 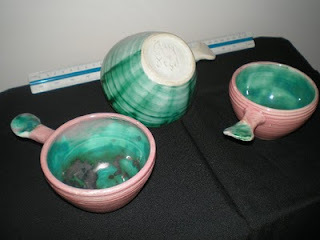 The glaze interior is patchy and the exterior is scored, but this is how Boyd and Perceval made and sold their earliest work. There is slight exterior crazing consistent with age. 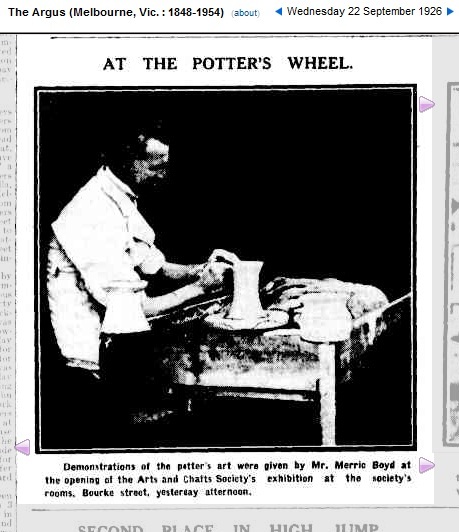 Merric Boyd, sometimes described as the father of art pottery in Australia, having held the first exhibition of his work in Melbourne in 1912. He had his pots fired in Hoffman Pottery kilns from1926 after he burned out his own. He is also thought to have modelled some decorations for use in the Mel-rose line. The Boyd’s are probably Australia's most famous and prolific artistic family over several generations.The pottery named "Open Country"was located at the corner of Wahroonga and Weeroona Roads Murrumbeena and the output sold through their shop at 500 Neerim Road, Murrumbeena, just a short walk from "Open Country". If you go looking for the spot, it is now a pile of cream brick 1960s flats. 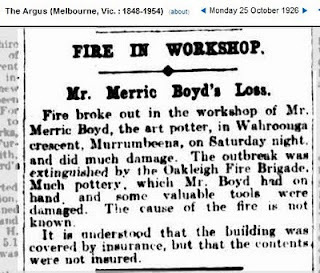 The Boyd home was at 3-5 Calloola Avenue, Oakleigh after they sold the pottery following Arthur's death. Eventually, a lot of the pottery was made at Neerim Road. Probably the best known was Arthur Merric Bloomfield Boyd (1920-1999), painter, and potter who married Yvonne Lennie, painter, one of their children was Guy Martin a Beckett Boyd (1923-1988), also later famous as a sculptor, he married Phyllis Emma Nairn. John de Burgh Perceval 1923-2000. Better known as one of Australia's leading painters,Perceval enlisted in the army in 1941 where he met Arthur Boyd and after his discharge he moved into the Boyd family home. He married Arthur’s younger sister Mary in 1944 and with others helped to establish “Arthur Merric Boyd (AMB) Pottery”. Sadly, his later life was marred by health problems. The following is edited from the Australian Pottery Blogs. Painting and pottery was closely intertwined in the Boyd family. Doris was a talented painter and decorated some of her husband’s pots. Their children learnt to make and decorate pottery at their parents’ knees and were able to use this skill as a way of making a living while they explored other areas of interest such as painting and sculpture. They married other artists and drew them into the family tradition. The second-world war interrupted their lives but also led them to new artistic associations. 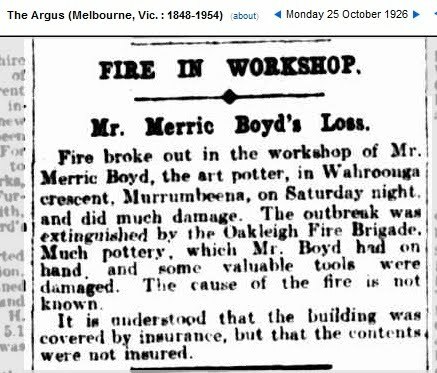 Merric’s father Arthur Merric Boyd (1862-1940) was a painter, not a potter, but his name lives on in the Arthur Merric Boyd (AMB) Pottery set up by his grandson Arthur, John Perceval and Peter Herbst at Murrumbeena in 1944. (Actually, they bought Hatton Beck’s pottery when the Becks moved to Brisbane.) Arthur left Australia for England in 1958 and went on to become one of Australia’s most significant painters, but pieces with various AMB marks continued to be made until 1962. Similarly, Merric’s younger brother Martin (1893-1972) was a writer not a potter, but his name lives on in the Sydney-based Martin Boyd Pottery set up by Guy with partners Norma and Leonard Flegg in 1946. Guy was training as a sculptor at the East Sydney Technical College (ESTC) after the war and needed an interim source of income. He returned to Melbourne in 1951 but the Fleggs continued to operate the Martin Boyd Pottery as a successful venture until slow sales caused in part by overseas imports put it out of business in 1963. Ford (p. 43) records the year of Guy’s return to Melbourne as 1955. In fact, he transferred his interest in the pottery to Leonard’s brother Ronald in 1951. 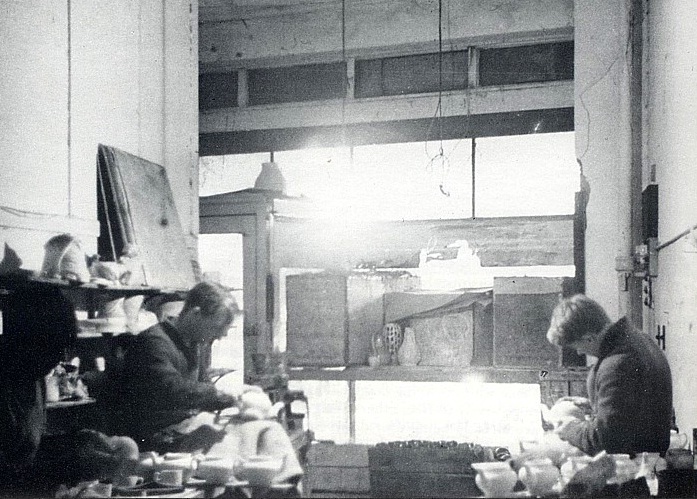 On his return to Melbourne, he set up a new pottery, the Guy Boyd Pottery, in 1952. He and his wife operated this until 1964, when he sold it to devote himself full-time to sculpture. Guy’s brother David worked with him as a thrower in Sydney in the start-up post-war years. This is where he met Hermia, an art student at ESTC experimenting with decoration at the pottery in her spare time. They lived and worked in Australia, England and France before closing their last pottery in Murrumbeena in 1968 to concentrate on other interests – David on painting and Hermia on etching and sculpture. Their work was marketed as art pottery through exhibitions rather than stores. 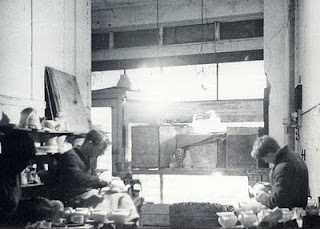 In 1960 they were guest exhibitors at the Potters’ Cottage in Warrandyte where it was reported that great interest was shown in the new techniques they had developed during their overseas travels and prices ranged as high as fifty guineas. The majority of e-Bay listings are from the Martin Boyd Pottery that has its own strong following. Ramekins abound and no wonder, because it was the pottery’s most popular production line and nearly a million were made. Ramekins were also a mainstay of the Guy Boyd and AMB Potteries. This form was simple to throw and decorate. The handle also lends aplomb, particularly when incorporated seamlessly into the form and decoration. Obviously the Army did not form the best impression of Arthur. I'm glad he didn't let this slow him down later.